300-SS-DST-A is rated 3.8 out of 5 by 4. Rated 5 out of 5 by Jerry from Love the brushed stainless finish. I installed this a week ago. It was easy to install. It took me longer to remove the old faucet than install the new one. I have always used chromed kitchen faucets in the past, and they always show water spots boldly. 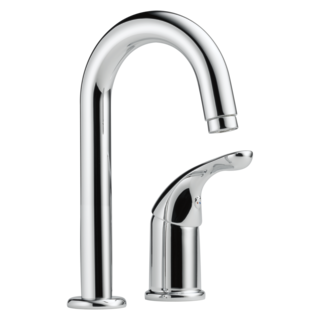 The brushed stainless do not show water spots so boldly as chrome. Just a note to the buyer. On the outside of the box, it says, 'lifetime warranty'. It is not your lifetime, it is 5 years. 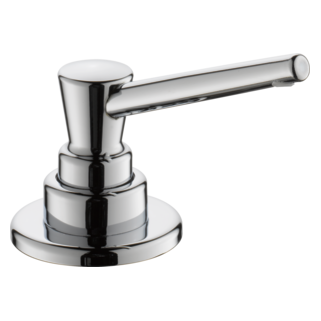 Rated 4 out of 5 by CB58C from Reasonably priced This is a nice faucet for the money. It must have a water restrictor because there is a lot less pressure than my old faucet. It will definitely save on water though. It should have taken about 10 minutes to install, but going from our old one to this new one took some special adapters and several trips to Home Depot. 5 hours later, and some swear words, my husband was finally done! Rated 1 out of 5 by Timothy70 from This faucet failed and soaked our kitchen cabinets and down into the basement. I did like the look of the faucet but I have never been completly satisfied with this faucet since we had it installed less than two years ago. I felt it let less water through than our old faucet but figured that was due to a water saving feature. Earlier this week the faucet failed and poured water from under the sink and damaged the cabinets and went down into our basement soaking the stuff below. The water was coming from the cartridge in the center of the faucet. I went to Home Depot to get a new part for the taps and was told that even though it is a lifetime garentee I needed to contact Delta to get the parts or purchase them. I called the number for Delta and had a very nice woman try to help me but she would not be able to ship the parts out until next Tuesday and then delivery time. This being said, I would not have had a kitchen sink for over a week with two young kids at home. I descided to remove the faucet and replace it with a different brand. I do not have any faith in this product or company anymore. What faucet will connect with a portable dish washer? Thank you for your question. 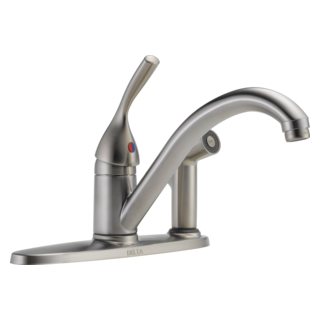 Delta Faucet model # 300-SS-DST has an aerator that is 15/16-27. While we do not manufacture an adapter for portable dishwashers to fit this aerator, we know that they are out there. You will want to make sure that there is a tight seal when using your dishwasher as any leaks that happen during use are not covered under the warranty. 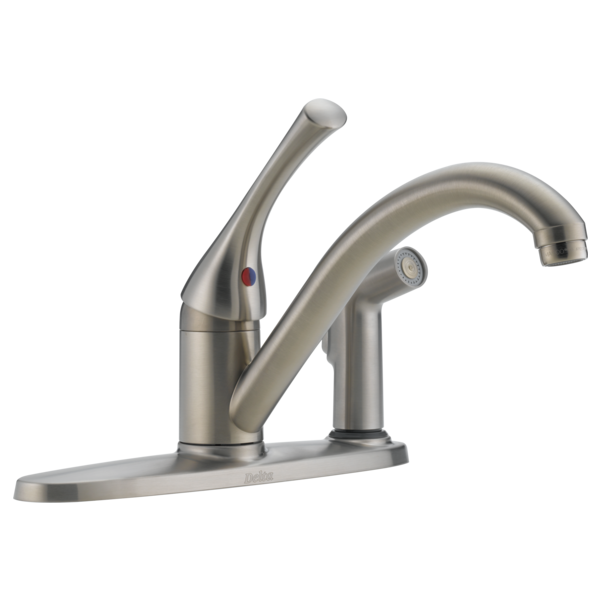 Not all of our faucets can be used with a portable dishwasher and those include pull downs, pull outs and any faucet with a cache aerator.